This is me with the EF staff at Tienanmen Square (you can see the Forbidden city in the background). I was not told that I was supposed to flail my arms about – now I look silly jumping, and I look silly for not looking silly enough. In the fall of 2013, Mr. Curtis was lucky once again. This time EF Tours asked him to join them on another International Training Tour. 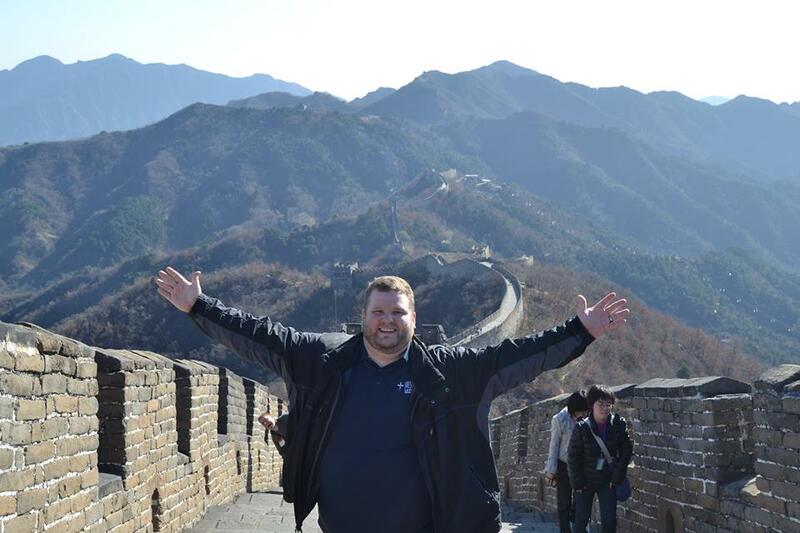 This time, he was going to get to spend 6 days in Beijing, China, helping to prepare 32 American teachers for running their own travel programs like the one we have here in Minooka. China wasn’t somewhere I ever thought I’d actually get to go. Sure, there’s not very many countries that I haven’t talked about with the other TAP teachers, but China always seemed kind of scary, like someplace we’d talk about being brave enough to go, but always someplace we’d push to further and further on down the list. China seemed like it’d be super intimidating. It’s huge, the food’s weird, the language is indecipherable… I had a million excuses. Boy, was I wrong! Beijing was one of the friendliest places I’ve ever been, right up there with Portugal and Ireland. The food was amazing, and included what I think may have been the single best meal I’ve ever had while traveling. Everywhere, nearly everything is written in English, so finding your way around is a snap. It was one of the best and most surprising experiences I’ve ever had while traveling. This trip was a little different from a typical TAP trip, because we didn’t travel all over the place. We stayed in Beijing the entire time, but with 20 million people in the city, it was plenty big enough to keep us busy for six days. The first question everyone seems to want to ask is, “How long was the flight?” And, to be honest, it wasn’t that bad. It was 13 hours and 40 minutes, but it didn’t feel like a second over 12 hours. I watched a few movies, slept for a while, watched a few more movies, slept some more, and next thing you know it, I was in China. I’m so used to getting off a plane with 40 other people, gathering them all up, and moving as a group to customs and baggage claim together that it felt a little weird to be navigating the Beijing airport all on my own. I usually don’t have time to get nervous about a foreign airport, because with so many people counting on me to guide them through, I just have to figure it out quick and go. This time, though, I took my sweet time – looking at some of the shops and restaurants, noticing the advertisement signs, even checking out the bathrooms (because as any former TAPper knows, one of the things you’ll always get in a foreign country is weird toilets). Eventually I made my way through customs, which was much simpler than I expected it to me, got my suitcase, and found our Tour Director, Robert. Of course Robert isn’t his real name, but it seemed that all of the Chinese people that worked in jobs that required interacting with English speaking tourists had an American sounding name. I kept forgetting to ask if they got to pick their American name or if they’d been assigned by some teacher way back in elementary school. Only six of us were scheduled to arrive that first day. 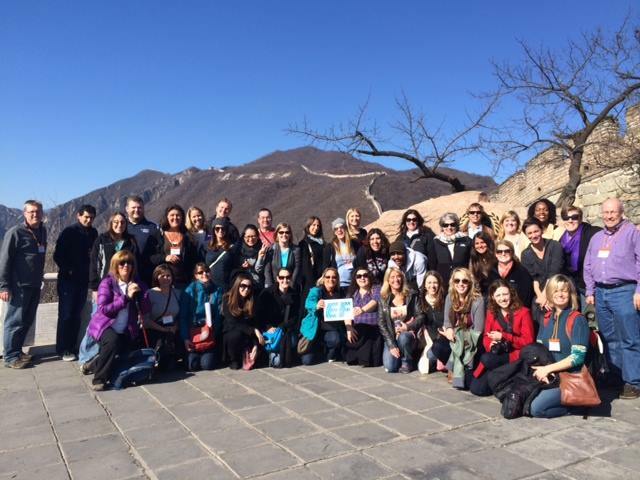 The whole gang at the Great Wall. The EF staff (Victoria, Katie, Jaime, and Jess) and Carolyn (another teacher who’s been running a group like TAP at her school in Colorado for 20 years) arrived just a little while later. We all got an extra day in China since we were actually working – that extra day gave us a chance to talk through some plans for the week, as well as get adjusted to the 14 hour time difference a bit quicker than everyone else. Thanks to some flight delays, I was the first in the group to arrive, so Robert and I chit-chatted for a while while we waited for the others. Once everyone was there, we met up with two other EF teams (we were the orange team, the others were blue and yellow) and headed to dinner. All together, that was six teachers like me – people that run travel programs, and I was by far the newest of the newbies. There were also about fifteen people from EF. It was a bit overwhelming, but loads of fun to share travel stories and swap secrets to running a successful program. Dinner in China is unlike anything I’ve experienced anywhere else. That first night all 20-something of us sat at an enormous round table in a beautiful restaurant. We were tucked away in a private room, which was probably good considering how loud it got. The middle of the table was taken up by a huge Lazy Susan, a round piece of glass that spun around and around. The servers brought dish after dish after dish – shrimp, chicken, fish, pork, vegetables, fruits, beef, noodles, rice… – and set them down on the Lazy Susan. You served yourself a little bit from each dish, and spun it on so the next person could try something. The food came out faster than even a group as big as our could eat it, and just about everything was delicious. Those friendships were short-lived, because after dinner the orange, blue, and yellow groups got split up – each of us staying in a different hotel. When we got to ours, we game-planned how to handle the arrival of the 32 teachers the next afternoon. Then we all headed up to our rooms to attempt to get a good night’s sleep. Sleep became an issue with this trip, so if I ever do get to return to China, I’m going to have to do some research on how to counter the jet-lag quicker. That first night I fell asleep on the world’s most uncomfortable bed pretty easily – it had been close to 30 hours since I’d woken up in my own bed in Illinois the day before, so I was tired. The problem was staying asleep. I woke up at 12, 1, and 3 – but was able to bore myself back to sleep. Finally around 4am, I couldn’t sleep anymore. I read for a while, watched Chinese TV, played games on my phone, but I could not get tired enough to fall back asleep. At 6:30 I finally gave up and went down for breakfast. We had a bunch of time before having to head to the airport to pick up the other teachers, so we walked from our hotel to Tienanmen Square, the largest public urban space in the world, and the site of many important historical moments. Wandering around the square, reflecting back on important moments in history, was one of my favorite parts of the trip. Find out more about that here. The rest of the day was a jumble of meeting new people at the airport, realizing that all of them felt as foggy and disoriented as I had the day before, and more amazing Chinese food. 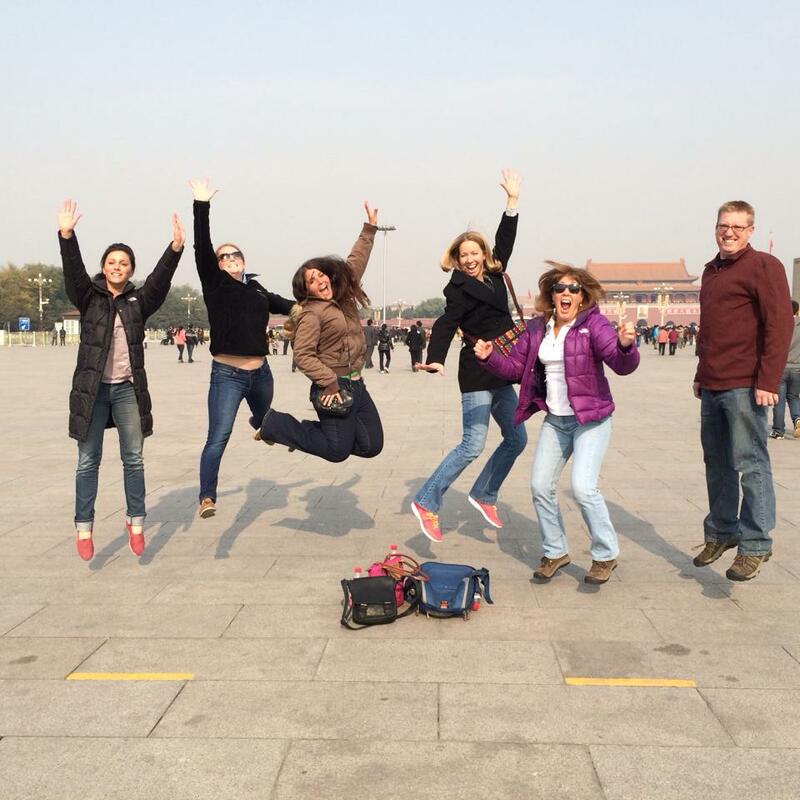 The following morning, we took the whole group back to Tienanmen Square, into the Forbidden City, and to the Temple of Heaven. That night we got to see a Kung-fu demonstration, but I made a note to myself that if I do ever bring students back to China, bring some Five Hour Energy for the Kung-fu show. As amazing as it was, almost every person in our group was still struggling with the jet-lag enough that they nodded off a few times during the show. The Summer Palace was the star of the third day in China. It was a huge temple/palace built in a beautiful setting out by a lake. We walked around the palace for a while, then took a Dragon Boat ride across the lake to get back to the bus. We stopped at a ridiculously huge shopping mall for lunch – where I had the best meal I’ve ever had in a foreign country – then stopped at the Pearl Market to see how pearls are harvested and made into jewelry. China is known for their pearls, so most of the women treated themselves, while most of the men struggled to find the perfect gift to bring home to their wives. 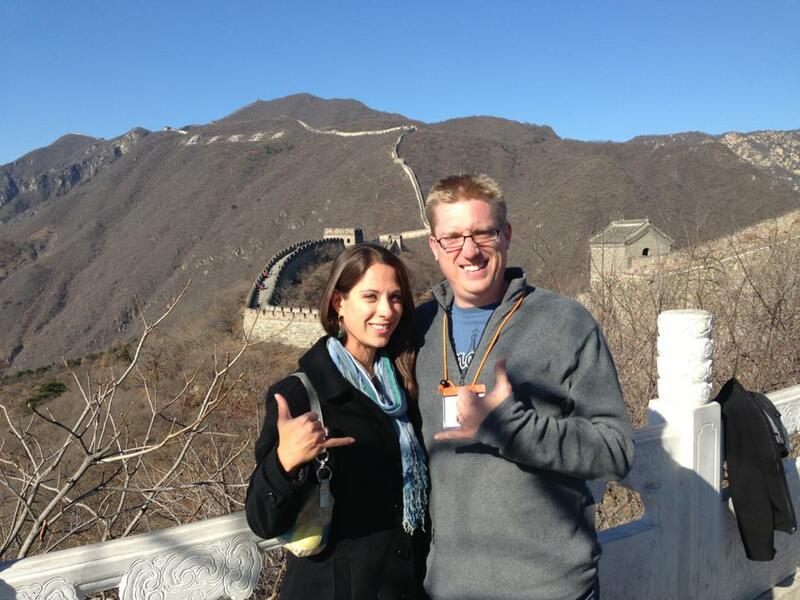 Me and my new friend Rebecca (a teacher from Hawaii) at the Great Wall. Then we headed off to the Night Market, where no one would buy a gift for their family. The Night Market has got to be one of the weirdest places I’ve ever been. It’s a bunch of food stalls set up along one street in the middle of Beijing. The stalls sell some pretty normal, and pretty amazing, food like fruit, dumplings, fish, noodles, and pastries. If you’re a bit more adventurous, you can also eat snakes, snails, starfish, and scorpions. There’s also shark, tarantulas, millipedes, silk worms, and all sorts of creepy crawly things for you to snack on. I enjoyed my fresh, hot dumplings and some crab pastries, but I avoided eating anything in the bug family, although it was entertaining to watch some of the other teachers eat scorpions, snakes, and spiders. Sunday morning was the whole point of the trip. It was our big conference. The whole morning was spent in the hotel conference room teaching the new teachers all about taking students on trips like these. I won’t bore you with those details, but I had fun with my hour long presentation. I know no one that’s ever been in my class will believe this, but I stood in front of the room and acted silly while telling dumb jokes – you know, a normal class period for me. Our last full day in China was my favorite one. We started the morning by visiting a Beijing high school. It was so different from schools here. They started out giving us a presentation on how their school works. They were 14-16 year olds who lived right there in dormitories at their school. They weren’t taking a variety of classes like we do here, instead, they were already training for their future careers. 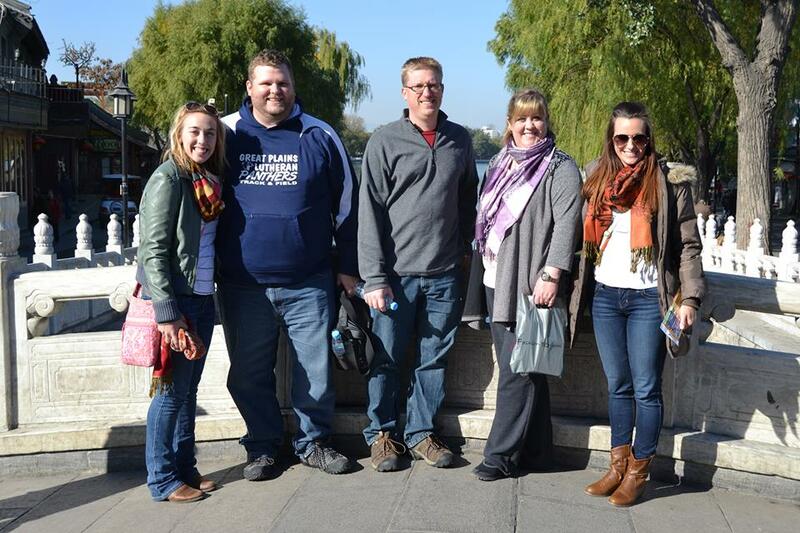 Some of the American teachers in the Hutong District in Beijing. We got to see two girls’ classes. One showed us how they were training for a career in “air service,” flight attendants. The other group that presented to us was a dance group. Their performance was really cool and can be found on our TAP TV page. After that, we got to wander around and see the PE classes, some regular classrooms, and see other parts of the school. Then, we made our way to the far north end of the city, and visited The Great Wall of China. That was surreal. The Great Wall is one of those places that I never thought I’d actually have a chance to ever see, so standing there was like walking around in a dream. We walked a few miles along the top of the wall, up and down, in and out of the battlements. It was one of the single most incredible things I’ve been lucky enough to experience. There are no words, really. It was just amazing. The way down from the wall was just about as cool – it was a luge, a small wheeled sled that we rode down in a big metal track, zipping and zooming all the way down the side of the mountain. It took five minutes of twists and turns to ride our way down to the base of the mountain, and it was probably the most fun five minutes I’ve ever had on a trip. It was an incredible way to wrap up our time in China. We had a little bit of free time on the last day, because our flight was in the late afternoon, so a group of us ventured out to the Hutong District, the oldest neighborhood in Beijing. With one other teacher, I rode in a rickshaw (just another in a long list of things I ever thought I’d do) around the Hutong. I felt like I was on the Amazing Race or something. 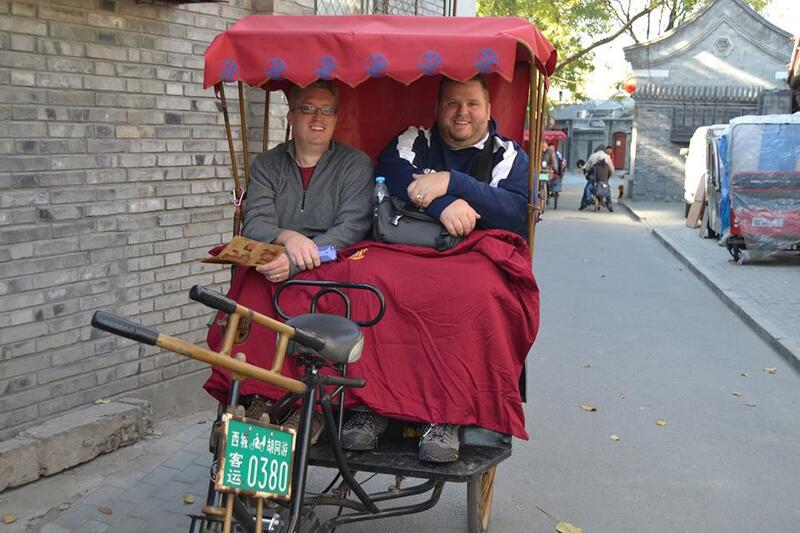 Nate (a teacher from South Dakota) and I rode around the Hutong District in style – a rickshaw. And just like that, my time in China was over. I learned a ton, but most importantly I learned to step outside my comfort zone, to not be afraid of anyplace. That no matter where I go in this world there’s going to be something new, something unfamiliar, and something scary – but at the same time there’s always going to be good people, good times, and good food. I cannot wait to go back to China with students someday and help them step outside their comfort zones and experience this amazing place. 1. I have a Chinese friend who I haven’t seen in years. She said that if there is a bit of free-time in the afternoons, she would be willing to fly to Beijing to come see me. I am DYING to see her. Do you think it would be worth her while, or would I have no time to see her? 2. When do you find out what hotel you’re staying in? 3. Would a picky eater (who hates all seafood) survive? I’m so glad you’re excited about your training tour in China – that was one of my favorite adventures of all time. These questions would be ones that would be great to ask your EF Tour Consultant, but I’ll be happy to give my two cents as well. 1. I don’t remember having tons of free time in Beijing. Most tours do allow for free-time, but Beijing is pretty structured. There was one day where we had a few hours in a shopping center to eat lunch and wander about, but I find those moments a great time to share ideas and experiences with the other teachers in the group. One night we went to a Kung-Fu show, which was really cool (but jet lag caught up to me and I dozed off a few times) – however, the other nights after dinner were pretty unstructured (we just sat around in the coffee shop/bar in the hotel), so that might be an okay time to catch up with a friend. What I would actually recommend, though, is asking EF if they can arrange for you to come home a day later so that you can gain everything you need to from the tour AND have time to see your friend. Of course, you’d have to pay for your own hotel for that day, but it may be worth it to see a friend. 2. Hotel and flight information usually comes within 90-60 days before travel. 3. I don’t care for seafood, and I loved everything I ate in China. Everything looks sort of weird, but it all tastes amazing. You will be just fine. If you like Chinese restaurants here at home, you’ll be find, because most dinners are family style and you can take as much as you want of the things you like and ignore the stuff that you don’t. Although, I’d recommend trying everything. Breakfasts are buffet style, and have a variety of American style and Chinese options.